Of Course, there is no denying that staying in luxurious resorts or hotels are what we all crave for. But nothing beats the experience of staying in boutique homestays in Ladakh. Wondering why we are saying this? Then tell us, where else you would find the hospitality of Ladakh humans? Where else you would get your cravings fixed for Ladakh’s cuisines? Actually, there is no better option to experience the vibrancy of Ladakh culture than paying a Local Home Visit in Ladakh region. 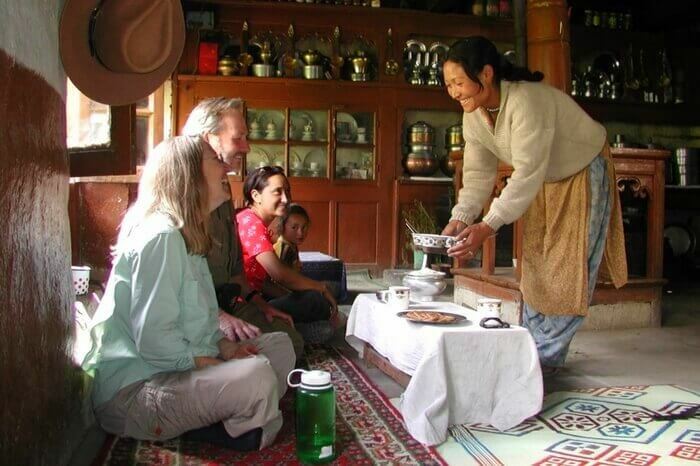 Now you’re wondering how will be your experience is going to be in Ladakh homestays. Fret not! We will let you know the major outline of Local Home Visit in Ladakh so that you could get the idea of how your visit is going to be over there. The homestays you’ll find in Leh town is run by extremely friendly human beings that will cater to all your needs. From guiding you the inside tips to cover the local places to visit in Ladakh to pampering you with their rejuvenating stories of past to exploring the local culture, your travel heart will scream a moment of WOW when you’ll make Local Home Visit In Ladakh. Get ready to book a homestay on your Ladakh tour package and worry not about a single thing like accommodations, network connectivity. As most of the homestays in Ladakh, when booked with Go2Ladakh, offers spacious rooms, fabulous decor and amenities like WIFI- LED TV. a garden and a restaurant. What else do you want extra? Don’t just wait and read. Hunt this offer. As Go2Ladakh is offering you the opportunity to Local Home Visit in Ladakh. Feel free to inspire your friends also about our offer and get reward points that could be redeemed on your next vacations.